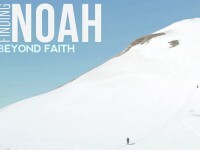 Director/Producer Brent Baum sat down recently to discuss the meaning of the title of his most recent film, Finding Noah. “When I first heard about the opportunity to film a group of men on a search for Noah’s Ark, my mind was thinking probably what everyone else’s was: Why would anyone do that? But as I heard the stories of these men, where they came from, what their passions were and why this search was so important, almost necessary, to them, I began to see a bigger picture. Working with and capturing the spirit of these brave individuals was unlike anything I had encountered before. Here were men just like you and me, men from Texas, Arkansas and Washington; men with sincerity and an authenticity of character. But these men dared to be different. They acted on their hopes, dreams, fears, and determination to attain a goal few others have even considered. Relying on the strength and support of their team members, these pioneers embarked on a life-changing journey to the top of a 17,000-foot mountain. The personal triumphs and lessons learned while living a month on Mt. Ararat’s desolate summit helped to give these explorers a fresh perspective and become stronger, more confident individuals. In his own unique way, each member had found a new beginning or a different outlook on life. This revelation formed the basis for the concept of the title. Biblically speaking, Noah was the start of a new humanity. The Ark was just a vessel for Noah; the real story lies in the fact that he was chosen by God to survive, to start anew. And much like Noah, these men, who in some ways also feel chosen, experienced their own second chance, like finding their own personal Noah. Director/Producer Brent Baum helped develop, produce, finance, sell and distribute over a dozen motion pictures as a film executive including THE WEDDING PLANNER and EYE OF THE BEHOLDER. Finding Noah is his first documentary.